On June 11th the Saudis merely shared with Israel a mutual distrust of Iran. On June 12th the Saudis leveraged this by going public with their plan to grant Israel an open flight corridor for airstrikes on Iran. This means, at least on the surface, that Israel would have an alternate route available if the Americans were not in agreement with an attack. This was surprising to people whose only knowledge of Middle Eastern politics is that Arabs and Jews don’t tend to get on well. This move has its foundations in geopolitics, however, and geopolitical thinking tends to trump ethnic friction — even Jew-hating — at a policy level (it doesn’t stop individuals from being difficult about this, however). This announcement is Saudi’s public response to an Iranian statement which came a day prior that they would “inspect” ships in the Strait of Hormuz if ships bound for Iran were messed with. This, of course, was just a veiled threat to close the Strait if Iran feels too pressured. And Iran might be feeling a lot of pressure these days considering Russia’s announcement a day prior they are not only supporting the new round of American sanctions (toothless though they are) but also suspending S-300 missile sales to Iran. Russia now claims that the missiles are banned by the intent of the sanction resolution, despite the verbage Russia quietly inserted into the document which specifically exempts S-300 sales from the ban. This is a major reversal and has Iran feeling very isolated and alone. The Iranians have Saudi (and the global economic recovery at that) by the balls in one very important respect: they can threaten the Strait of Hormuz. Around four fifths of the world’s oil supplies pass through the narrow waterway, making it one of the narrowest yet busiest shipping lanes in the world. If Iran were to start stopping ships to “inspect” them it would impact the price of oil, immediately causing a spike in general energy prices and thus threaten the global economic recovery by pushing already thin European margin expectations lower. [Link to Reuters story detailing some of this. It doesn’t get into much depth but does give a hint at the gravity of this threat.] If Iran wanted to be really mean it could drop (or merely act as though it has dropped) a few mines in the lane somewhere and even without an actual incident global shipping insurance would skyrocket, thus causing an even more massive spike in oil prices until de-mining operations concluded (which could take months depending on the situation). This — the very credible threat Iran poses to global oil supplies — is dictated by geography and therefore cannot be easily mitigated or averted. It is this sort of geographically dictated balance which forces a certain uneasy balance in the Middle East. But what could upend the balance and force the location of a new one? Turkey’s rise on the political scene poses problems for Iran as well as Egypt because it upstages both of them in their attempts to be the political face of the Middle East (Egypt is already the public face of the Arab countries). Turkey is still trying to stir the pot using the flotilla incident as a spoon in the Jew-hate stew, but how effective that will continue to be is questionable at this point as there are limits to the utility of Israel-bashing and that sort of play can be easily trumped by an Iranian threat to Persian Gulf shipping. But how to shift this balance entirely and create a new, more stable political power structure in the Middle East that would endure beyond a quick undercutting move by someone with geographic leverage? Unfortunately for the Middle Eastern states, the geography of the region dictates that Turkey will be the only country with enough independent clout to not rely on a coalition, while Saudi will continue to have the big money clout and Iran will have the destructive power to threaten the whole system. So each is limited by another in some way but not in a stable or predictable way because each only has a single type of influence each: the influence of access (Turkey), the influence of generative power (Saudi), and the influence of destructive power (Iran). Of course, in all of this Saudi’s voice in international politics is already a fair bit smaller than Egypt — a gatekeeper state itself — whose voice is a fair bit smaller than Turkey. So what is a way to decisively change the outlook in the region? It is impossible to remove Iran from the shores of the Strait, impossible to remove Turkey from being the access point (geographically as well as politically and culturally) between Europe and Asia as well as the absolute gatekeeper to Black Sea access, impossible to un-deposit the oil present in Saudi Arabia and impossible to revoke Egyptian control of the Suez Canal. The only way to significantly alter the balance would be to alter the implications of one of these geographic factors. The simplest of these to change would be the effect Iran can have by being on the shores of the Strait of Hormuz. The three regional choke-points which channelize shipping and offer threat leverage to the states that border them. Currently the Strait is significant because most of the world’s oil flows through it. But what if that could be somehow avoided and an already strong (but usually muted) regional player were brought into the calculation from an unexpected angle? 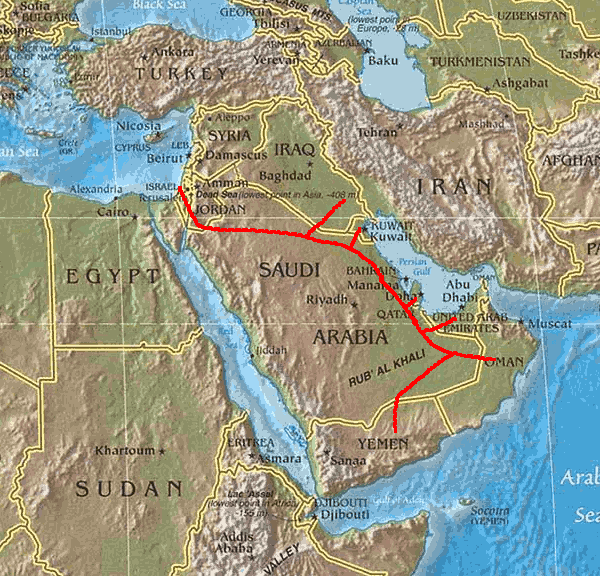 If Saudi were to fund the construction of a pipeline which bypassed the Persian Gulf entirely, but did not run to the Red Sea (which could merely create two new gatekeeper states if and when the political winds shift: Egypt on the north end with the Suez and Yemen or any number of African States on the other), but rather ran a much more secure route to the Mediterranean Sea through Israel. The pipeline would have branches running from the countries over which Saudi needs to gain influence; most notable are Kuwait, Iraq UAE and Qatar. Israel sounds like an unlikely choice, and it is, but that is one reason it would be a very secure relationship for the Saudis. Pushing oil through the port at Yaffo or Haifa would not cost very much as pipelines go, be much cheaper and less technically (and politically) challenging than the Nordstream project, instantly undercut the Iranian’s Hormuz threat and easily pay for itself over the life of the project. It would also secure but not empower Israel without undercutting the Egyptian position. If the pipeline were built with regional instead of just Saudi oil export in mind, Iraq, the UAE, Qatar, Yemen, etc. would all suddenly find their interests in line with the Saudis and Israelis on many issues because of the cheap, secure route now available for their oil. The pipeline route would be the preferred route for European and American oil exports in the best of times and a ready alternative in the worst. But wouldn’t that give Israel a lever in the Arab states and undue influence? A lever, yes. Undue influence? No. The traditional Persian Gulf route would continue to exist. 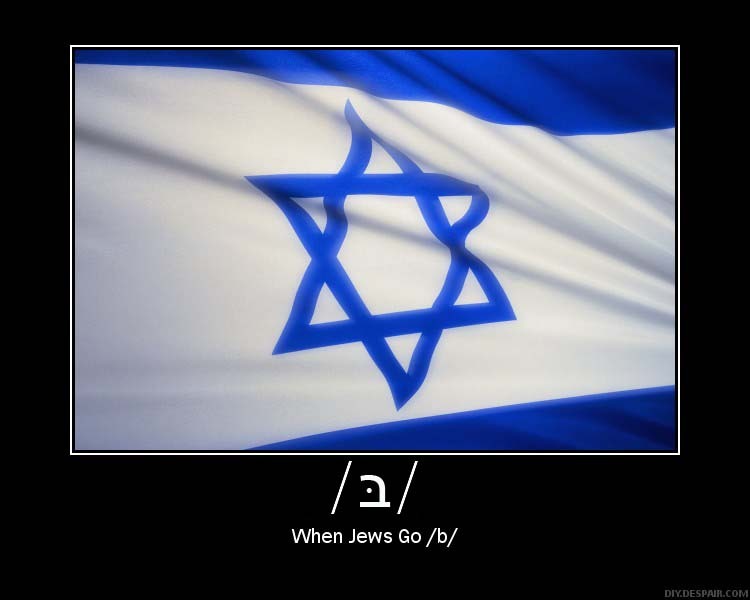 It would be as easy for Saudi to shut Israel out of the loop as it would be for them to shut the Iranians out. The difference is that Iran is a threat to Saudi, but Israel is not. As the formerly combative states neighboring Israel have found in the past forty years or so, there are significant benefits to cooperation with Israel and no real downside. 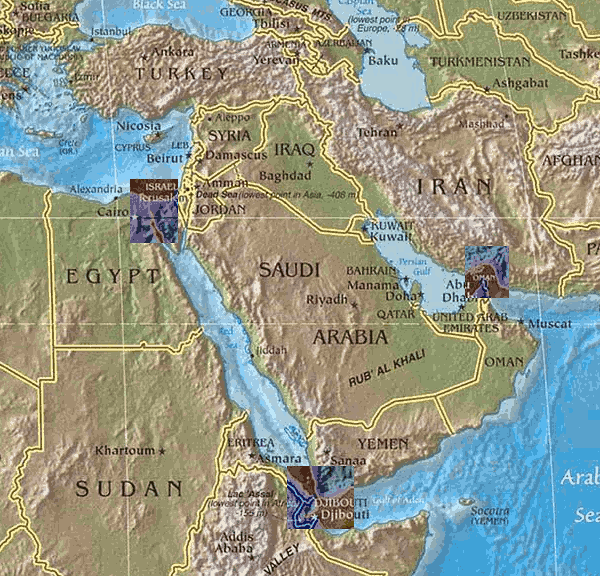 Egyptian and Israeli policy are in lock-step, the Jordanians get their ocean access through Israel (not Syria and Lebanon), and even Syria coordinates most of what they are up to with Israel. There are social frictions but no concrete geopolitical reasons to move against this — and the social frictions are easy to overcome by subtly slowing or stopping the anti-Jewish media propaganda, a move which costs nothing. Cutting Iran out of the influence game and removing the teeth from its threats could significantly shift the balance of the region. This could happen in a way that would likely avert widescale military conflict because it would promote a more stable situation. Turkey would now be in competition against a Saudi/Israel/Egypt bloc while Iran merely attempted to focus on Iraq and affecting a re-alignment with the US. Of course, Iran’s Iraq control plays would be made more difficult by the new influence Saudi could exert by lording its control of Iraq’s new Mediterranean pipeline access over it, but this represents a profitable diversity of options for Iraq, not further limitations. Altering this energy export situation would force a realignment across the region which would, over the long term, promote stability because it merely increases creative options while limiting destructive ones. It would diversify the political economy instead of raising barriers to competitive entry — to put it in power game terms. So will we see something like this? Possibly. But who knows. Never underestimate the Arab states’ ability to never miss a chance at missing a chance. This entry was posted on Sunday, June 13th, 2010 at 10:11 and is filed under Politics / Geopolitics. You can follow any responses to this entry through the RSS 2.0 feed. You can skip to the end and leave a response. Pinging is currently not allowed.